Questia Media, Inc., a leading educational resource provider with the world’s largest online liberal arts library, has been acquired by Gale, part of Cengage Learning. New York, NY – January 29, 2010 – DeSilva+Phillips, Mediabankers ™, announces that its client Questia Media, Inc., a leading educational resource provider with the world’s largest online liberal arts library, has been sold to Gale, part of Cengage Learning. 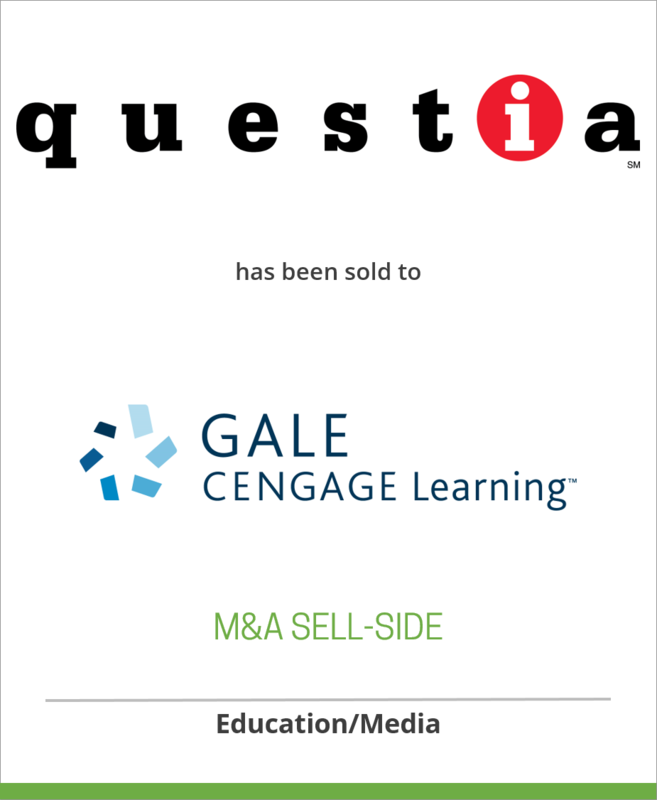 Gale, part of Cengage Learning, has acquired the assets of Questia Media, Inc., a leading provider of information and educational resources to students through its questia.com and questiaschool.com products. Questia provides a premium subscription-based online information service that gives users 24/7 access to more than 76,000 books from 300+ publishers and millions of articles from journals, magazines and newspapers. Recent product access enhancements introduced by Questia include an iPhone application enabling mobile access to Questia’s entire library, and Research Wizard, a Facebook application that facilitates community research. Gale will support these and develop other new applications to enhance the research experience for users. More information about Questia Media is available at http://www.questia.com/. “Questia has developed excellent products for learners and educators, with quality content and unique technologies created specifically for college students, professors and high school students,” said Patrick C. Sommers, president, Gale. “The business has a solid subscription base and is developing unique applications to extend its reach to users around the world. “Questia will further broaden Gale’s extensive content base, by adding information from tens of thousands of scholarly books selected from leading publishers to support learning in high school and college. In addition, it will enhance Gale’s offerings with new research and productivity tools, lesson plans, and professional development for the classroom,” said Sommers. “But perhaps most importantly, Questia will expand our depth and reach to users who begin their search for information on the Web,” said Sommers. Cengage Learning delivers highly customized learning solutions for colleges, universities, professors, students, libraries, government agencies, corporations and professionals around the world. Gale, part of Cengage Learning, serves the world’s information and education needs through its vast and dynamic content pools, which are used by students and consumers in their libraries, schools and on the Internet. It is best known for the accuracy, breadth and convenience of its data, addressing all types of information needs from homework help to health questions to business profiles in a variety of formats. For more information, visit http://www.cengage.com/ or http://www.gale.com/.